Branding your company is a big, arduous task. It’s not just a logo, it’s not your business cards, letterheads and advertising. What a lot of people and companies don’t understand about branding, is that your brand is not what you say it is, it’s what the consumers believe it is. It’s what the consumer feels about your brand. How do you communicate with your consumers to understand what they’re thinking, and how do to align their beliefs with your own brand strategy? Enter social media. The term social media gets thrown about a lot, and social media strategy equally so. However, where does a social media strategy actually fit within your brand strategy? How do you leverage social media channels to effectively communicate with your consumers and how do you use social media to affect change within your brand strategy? For starters, social media is a tool to reinforce your marketing communications pillar. It is not a separate entity; social media should enhance your marketing objectives and then your business strategy. Your business strategy aligns with the perception of your brand. This process is ever changing only because your consumers’ opinions are ever changing. What social can bring to the table is immediate, effective understanding and communications with your consumer base. Social is where you will find the most up-to-date brand opinion. This is important, vastly important to your brand, because you can decipher what your consumer believes, understand their concerns and with quick process, adjust the marketing communications to align your brand communications with the consumer’s perception. Large words, I know. What is important to know is, consumer brand perception can and will change faster than marketing or brand channels can keep up with. Social offers a unique point of view of what’s happening in the eyes of the consumer and allows for rapid modification to marketing communications. Picture this: Your brand launches a new product to market. This product is supposed to change the way people look at your brand. It’s meant to instill faith in your brand and some sort of positive, hopeful emotion. Now, let’s say there is a backlash against the product. Your product is either too expensive, insulting or just downright lame. Your consumers have an obvious opinion about this. Where do they go? They go where they spend the most of their time, Facebook and Twitter. Their opinion about your product is posted online, for their network, the network’s network, and the world to see. And with 90% of consumers trusting recommendations from people they know*, more consumers gravitate to the opinion and now you have a mess on your hands. You have a Facebook fan page. The consumers post their discontent on your fan page’s wall. What do you do? Delete them? No! You respond respectfully and send the consumers’ opinions up the ladder to the marketing communications department. The marcom department, after dealing with problem at hand, should send it up to the business strategy arm. If you don’t have a business strategy arm, you should. Immediately, decisions should be made as to what to do with the information. It’s not a matter of how to stop this consumer belief from impacting your brand, because it IS your brand now. The matter is, how do you change it. Brand perception is no longer a top-down activity, it’s a bottom-up enterprise and social is your inroad to the perception. What you do, what you say, how your brand reacts on social will have an immediate effect, positive or negative to your brand. 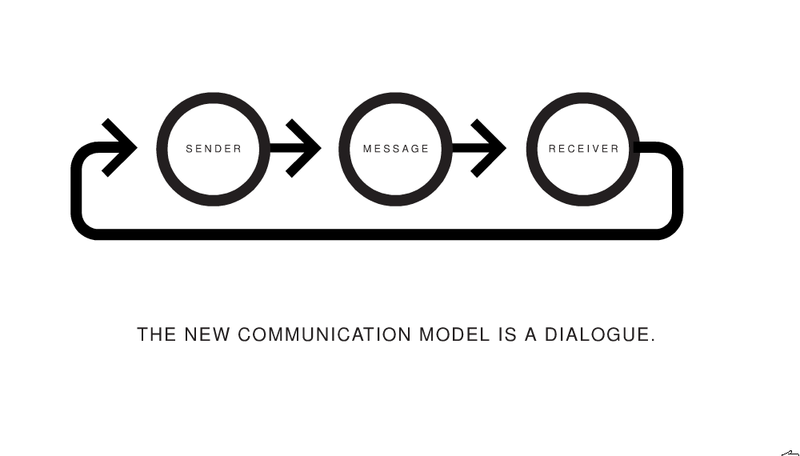 This process requires a new model of communication similar to that, which was introduced in the book, “The Brand Gap” by Marty Neumeier. One item of note, the brand and social “strategy” are not solid, concrete action plans. Think of them as an organic, living system that’s ever changing. People’s beliefs change and your brand will have to evolve along with. Your social communication should have a clear, precise path to the decision makers in your company. If your decision makers can’t hear what your consumers are saying about your brand, then you have lost what little control over brand perception you had. Your consumers are speaking about your brand through your social channels to, what they perceive as, people who can change things. Why not send that message fast and direct? The longer you avoid a clear, established, path from social media to the brand decision makers, the longer it will take to recover, redefine, or reinforce your brand perception and ultimately, your bottom line. Good primer on making insights from social actionable by making sure the right business processes are in place. Of course agencies aren’t perfect either and sometimes get stuck with a ‘check the social box’ mentality where the solution doesn’t go beyond putting simple share buttons on the page.